Thank you Avidia Charitable Foundation! 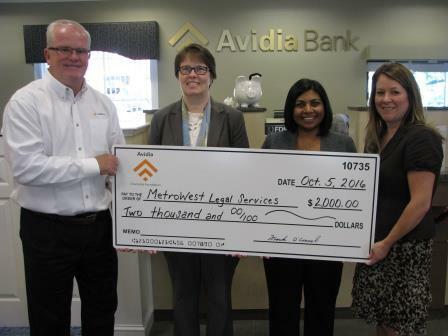 The Avidia Charitable Foundation recently donated $2,000 to MetroWest Legal Services, located in Framingham, MA. Presenting the check from L-R: Mark O’Connell, President & CEO of Avidia Bank; Elizabeth Soule, Esq., Executive Director of MetroWest Legal Services; Sonia Shah, Development Director of MetroWest Legal Services. Stephanie Luz; AVP Market Manager of Avidia Bank. This donation is to help Eviction Defense Foreclosure Prevention Project. Avidia Bank is a $1.2 billion mutual community bank, headquartered in Hudson, with branches in Hudson, Westborough, Clinton, Leominster, Marlborough, Northborough and Shrewsbury.